Paul Woods, Founder of the Pavement Stencil Company, passed away October 21, 2017. 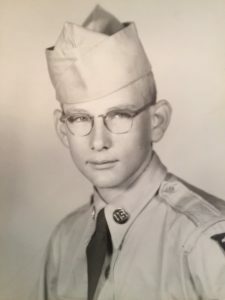 Paul was a 20 year US Army veteran and served in both Korea and Vietnam. In 1990, Paul started the Pavement Stencil Company and they have been serving the Pavement Marking industry ever since. As a tribute to our fellow veteran, we are including his obituary provided by his family. Rest In Peace, Paul. Thank you for your service. October 21, 2017 Paul Houston Woods, 80, passed away peacefully at his home in Garner, N.C. Saturday, October 21, 2017. He fought a short, courageous battle recently with cancer. His loving wife, Anne Bell Woods, survives him. He leaves behind his cherished mother-in-law, Vera Hurst. Paul was born in 1937 in Whiteville, N.C. to Bessie Avant Woods and William Mitchell Woods. He is survived by his sisters, and brothers-in-law, Betty and Henry Stevens, and Doris and Leroy Honeycutt; many nieces and nephews survive him in addition. Children Calvin and Beth Bell, Melinda Bell Dickey, John Bell and Niki Bell also survive him. And also survived by his grandson, Carson Bell. His parents, and brothers, Herman Butler and Thurston Butler; and son-in-law, Terry Dickey predecease him. Paul joined the United States Army at an early age where he spent 20 years serving his beloved country. He belonged to 101st Airborne Division, known as the ” Screaming Eagles”. He served in the Korean and Vietnam Wars and was stationed during his military career in Germany and Korea. He was awarded many medals and honors including a Silver Star, which is the third highest military award designated solely for heroism in combat. He also received a Bronze Star and a Purple Heart medal. He was Army Special Forces and paratrooper. Furthermore he earned the National Defense Medal, several Korean and Vietnam Service and Campaign medals, and many Merit and Conduct medals. After retiring from the military Paul created a company that was leading edge in hydroponics. After selling to a corporation he organized another successful business, The Pavement Stencil Company in Longwood, Florida, later moving it to Roanoke, Va. Paul was also a published author, and had just finished a new book called, “The Expendable Soldier” based on his experiences in Vietnam. The family wishes to thank Transitions Hospice Care and Duke Cancer Center for their dedicated service.